Lilith Collett lives in an Eden she is bent on destroying. If her family vex or thwart her in any way, the paradise of a garden that enchanted their childhood suffers for it. The vine, the rockery, the pergola - nothing at Cold Domain is safe from Lilith's ruthless slash-and-burn policy. Enter an archangel: Miguel-Angel Arqueso Algaron Perez de Vega, under whose spell downtrodden Barbara dares defy her mother. And when William's lover Caspar also joins the battle in his own subtle way, the fates of the Colletts and their garden are finally and unexpectedly sealed. I wanted to write a novel about how difficult it can be, for those women for whom mothering has been more of a chore than a pleasure, to shake off their grown-up children. The novel took months to get started. My first two characters, Mrs Collett's son and his wife, stayed flat on the page while I tried to kick them to life. Then suddenly I realised, "But they're both men!" I knew very little about gay relationships. I found my reading around the topic fascinating. It seemed to me that the distinction between older men who had spent their lives being discreet and younger gay men who were comfortable in their situation in some ways mirrored the psychological differences between pre-feminist women and those raised after the sixties. The book's a double love story and a comedy. I'm rubbish at games like chess, where you have to think ahead. So I look back now and I am amazed I wrote a story with so many merry twists and turns. "A streamlined, ruthlessly stripped-down psychological family romance with enough plot twists and character revelations to fuel a book three times as long, as wicked and funny as anything Fay Weldon has ever written. 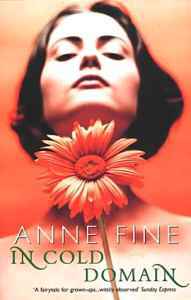 Anne Fine is brilliant"
"A glorious tirade against the grind of motherhood"
In Cold Domain is a novel for adults by Anne Fine. it was first published by Viking in 1994. Order the Black Swan paperback edition from Amazon, or from any bookshop or library (ISBN: 978-0-552-77765-0). In Cold Domain has been translated into French, Italian and Spanish.